CCricket - Walsden v Ramsbottom. Nick Barker for Walsden. Walsden are through to the last 16 of the Lancashire Knock Out Cup after a six wicket win at home to Greenfield yesterday. The visitors recovered from 57-4 to reach 158 with 71 off 78 balls from Jake Caudwell, who struck five sixes. Nick Barker’s 4-13 figures were the best of the home bowlers and the skipper followed up with 45 as Walsden knocked off the runs inside 26 overs. Josh Gale followed up Saturday’s 160 with another 46 and James Rawlinson added 31. 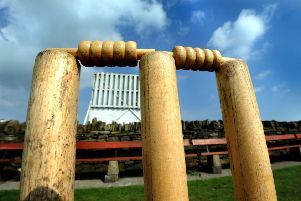 Walsden will be at home to Crompton in the third round on Sunday, July 1. Crompton will be making a quick return to Scott Street after winning there in the T20 on Friday.